As I’ve progressed into adulthood, I’ve found that thoughts about my body have taken up a greater proportion of time than ever before. What to feed it, how to clothe it, how others perceive it, and many more concerns have arisen, all with the ongoing subtext of aging. This is my peak, I’ve thought to myself on many occasions. Or, I’ll never look as good in that dress again. These thoughts are usually quickly followed by self-reprimands. You’re a feminist, I’d say to myself. You know that cute clothes and makeup are only for them, not for you. A six-pack is just another type of unnecessary self-accoutrement. Be kind to yourself. Writing has helped me to gain perspective, and also distance, on these questions of body and role. Specifically, I’ve begun looking at found text in a wholly new way, to tease out the underlying messages about femininity. The following erasure poems represent an attempt to redefine the text and challenge portrayals of female bodies and roles. Very good, she heard him say. Her to be the same. A radiance for a moment. of these girls and nearly all. Richardson, Dorothy. (2007, October 27) “Pointed Roofs: Pilgrimage, Volume 1,” Project Gutenberg EBook #3019. Retrieved from Project Gutenberg. 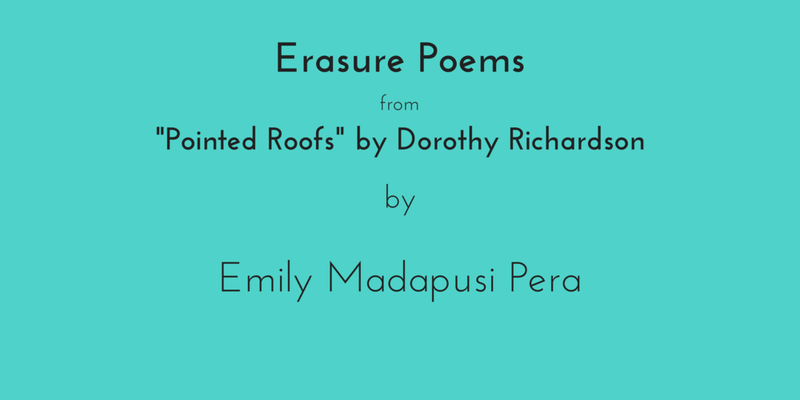 Emily Madapusi Pera is a writer based in Chicago and Providence, RI. She has been previously published by Scout & Birdie and is excited to appear in its pages again. Emily has also been featured by Back to Print, Wasted Pages Anthology and Sliced Bread. She'd like to dedicate these erasure poems to Dorothy Richardson, a feminist writer who has provided much inspiration. Check out her Three Poems from our First Impressions issue and her piece, Café Mysteries from our Messy issue!